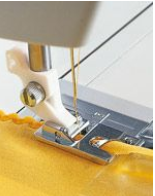 Learn what all the feet for your machine and the optional accessory feet can do for your sewing. This is a technique class only. No project will be created. However, you may want to create your own resource manual just like the instructor! Let's work our way through the accessory guide! Bring a binder with plastic sheet protectors and we will give you the pages to attach your samples to. The pages will be from the accessory guide. July- Decorative stitching feet - ribbon feet, beading feet. . .